Chronic Gout Duration: Imaging and Timeline explains how symptoms get worse the longer uric acid is untreated. Specifically, I review a study of how images of gout symptoms change over time. I wrote Chronic Gout Duration: Imaging and Timeline for gout sufferers who want to understand how long it takes for uric acid to damage joints. In detail, I’m reviewing a gout study of how long it takes for different types of damage to show on ultrasound scans. This is my layman’s review of a study of gout duration. In detail, it looks at ultrasound images of gouty knees and toes. This study aims to associate different types of ultrasound image with the duration of gout. Also, to compare those ultrasound images with the “gold standard” of microscopic analysis of joint fluid. Then assess if ultrasound images can be used as a method of early detection of gout. Scientists selected 100 participants for the study. Comprising people without confirmed gout who had one or more swollen knee or big toe joints. Then they examined 98 knee joints and 33 big toe joints, using ultrasound. Next, they analyzed joint fluid under polarizing microscopes. 2 years (range 0.15-20). Floating clusters of uric acid crystals identified by ultrasound bright spots. 3.5 years (range 0.5-20). Clusters of uric acid crystals attached to cartillage identified by ultrasound double contours. 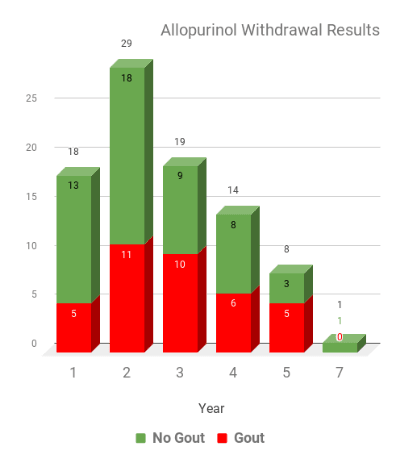 4 years (range 1-20). Bone erosions. 12.5 years (range 2-24). Tophi. There is a common gout timeline revealed by ultrasound of floating echoes, double contour, erosion, then tophus. However, the significant overlap reveals different rates of progress between individuals. The authors conclude that ultrasound is currently useful in screening probable gout patients. But diagnosis should be confirmed by joint fluid analysis. I can see that joint fluid analysis is required to confirm gout diagnosis. 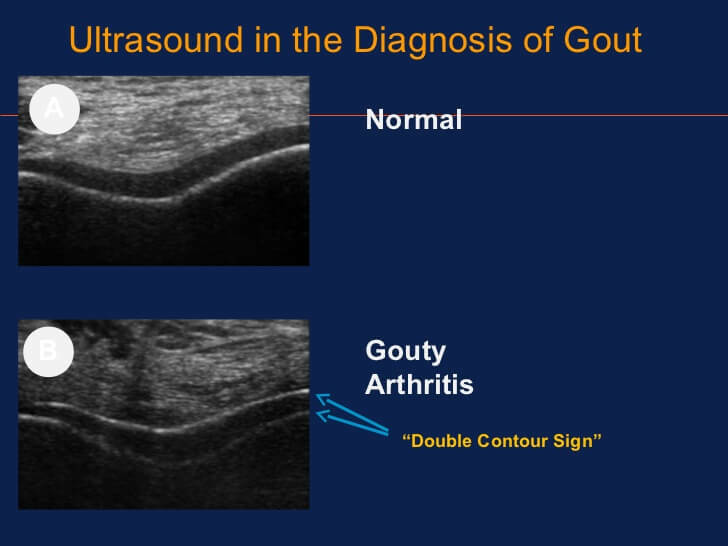 But, ultrasound adds more information by identifying how far gout has progressed. So this is particularly useful in seeing joint damage, compared to relying on patient reports of pain intensity and frequency. 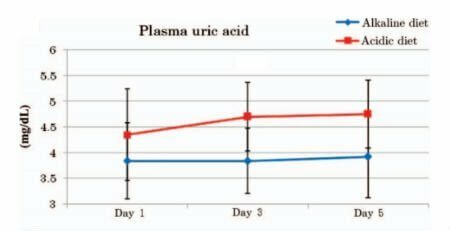 Finally, though this isn’t mentioned in the report, ultrasound might help identify if uric acid deposits are dissolving for patients on uric acid lowering treatment. In a separate study of gout duration, I will look at uric acid levels. In conclusion, you can see that ultrasound can help with gout diagnosis. Also, if you are having uric acid lowering treatment, it might help identify if your uric acid deposits are dissolving. If you have had ultrasound images of your gout, please share your experience with other gout sufferers. Your email address is safe - I will never share it with anyone else. Each of my update emails ends with an Unsubscribe link. So, you can stop updates whenever you like. Then, rejoin whenever you like. You are in control. For more gout info update services: Gout Info Update Service. Elsaman, Ahmed M., Eman MS Muhammad, and Frank Pessler. “Sonographic findings in gouty arthritis: diagnostic value and association with disease duration.” Ultrasound in medicine & biology 42, no. 6 (2016): 1330-1336. Gout Duration Symptoms Imaging PDF. Abhishek, Abhishek, Ana M. Valdes, Weiya Zhang, and Michael Doherty. “Association of Serum Uric Acid and Disease Duration With Frequent Gout Attacks: A Case–Control Study.” Arthritis care & research 68, no. 10 (2016): 1573-1577.